MAGIC FOR NOTHING is the sixth book in the InCryptid series. Readers can jump right into the storyline although spoilers for the previous book, CHAOS CHOREOGRAPHY, are given. MAGIC FOR NOTHING switches narrators as we start to see the life of Antimony “Annie” Price, the younger sister of Verity Price who was featured in CHAOS CHOREOGRAPHY. Annie is forced to go undercover in the very organization her family has spent generations avoiding- the Covenant of St. George. Fortunately, her stint with a circus gives her an edge and Annie soon finds herself in the midst of a diabolical Covenant plot, with no help immediately available. Can Annie find a way to save herself and the lives of the people she’s grown to love? I didn’t expect to like Annie. 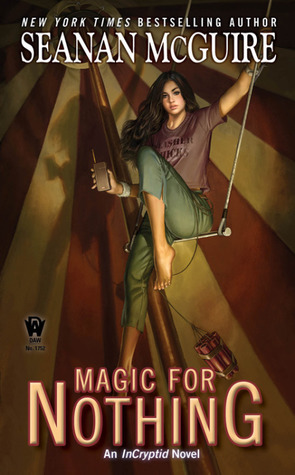 Prior books featuring her older siblings have painted her in a less than appealing manner and Annie initially does nothing in MAGIC FOR NOTHING to dispel that impression. However, Seanan McGuire isn’t a master in the urban fantasy genre for nothing as a different view of Annie starts to emerge. By the concluding chapters, I was cheering for Annie and hoping against hope that Seanan McGuire was not going to leave me hanging. And oh, does Seanan McGuire leave us hanging! The cliffhanger in MAGIC FOR NOTHING is perhaps one of the most heart breaking ones I’ve ever read. Why, oh why, must I wait for the next installment rather than digging right in and seeing what happens next? Seanan McGuire, please hurry with the next book as I must know what happens! MAGIC FOR NOTHING introduces us to a whole new aspect of the InCryptid world and I’m eager to see what ensues with Sam, Leo, and the Covenant. Even better, we learn more about the Aeslin mice. Seanan McGuire never fails to deliver a phenomenal tale and MAGIC FOR NOTHING is yet another example of her stunning talent. Highly recommended! It all started with cookies and chocolate…. Mercy Thompson Hauptman has been abducted from a convenience store after running out to buy more eggs for the cookies she is baking. Unfortunately, the kidnapping isn’t part of a local plot but instead involves the head of the Milan seethe and ultimately the leader of all the European vampires. Iacopa Bonarata, also known as the Lord of Night, intends to use Mercy against her mate and Alpha werewolf, Adam Hauptman. Cut off from the pack bonds that allow Mercy and Adam to sense one another, Mercy will have to survive in a different world where the rules and relationships are very different from the ones she is used to. SILENCE FALLEN is the tenth book in the Mercy Thompson series and wow, this is a series that never gets stale! SILENCE FALLEN is best appreciated in the context of the series as a whole, particularly since the relationships have already been established and the strength of those bonds is part of what makes SILENCE FALLEN so gut-wrenching. Readers familiar to the series should note that the narration in SILENCE FALLEN is slightly different as the story alternates between the points of view of Adam and Mercy, with the time line not staying strictly linear. 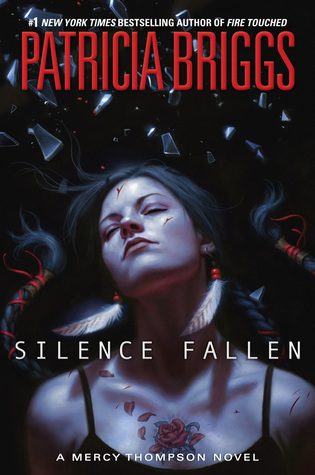 SILENCE FALLEN takes the Mercy Thompson series in a whole new direction as we see the world continuing to broaden. We are beginning to see the worldwide impact of Adam’s deal with the Fae that made the Tri-Counties a safe zone. The politics are starting to get sticky and it’s going to be interesting to see where these new developments take us in future books. I love that we get to see Mercy’s independence and determination shine through. She is on her own for most of SILENCE FALLEN and we are reminded of how she survived without a pack prior to her relationship with Adam. Mercy is a fighter but she also knows her own strengths and weaknesses. Mercy is perhaps my favorite urban fantasy heroine as Patricia Briggs shows us what a strong, resilient woman can do, both with her mate and on her own. SILENCE FALLEN is yet another stunning installment in the Mercy Thompson series. Patricia Briggs is without a doubt one of the masters of the urban fantasy genre. Highly recommended! I love urban fantasy anthologies and Jim Butcher is one of my favorite authors so I couldn’t pass up on reading SHADOWED SOULS. And oh, what a treat SHADOWED SOULS is for readers! Eleven phenomenal urban fantasy authors have joined forces to compile a fascinating taste of their worlds for us to explore. Jim Butcher’s “Cold Case” is obviously my favorite story in SHADOWED SOULS, as I’ve been following the Dresden Files for many years and I love this glimpse into Molly’s role in Mab’s court. Jim Butcher ensures that the story stands on its own merits but I suspect that anyone who gets even the tiniest taste of Jim Butcher’s world is going to want more! Seanan McGuire is a more recent addition to my favorite urban fantasy authors and boy, what an interesting twist on the succubus theme. Elsie Harrington just wants to support her cousin’s derby game and get over a broken heart. Instead, she finds herself aiding in a rescue. I’m still working my way through Seanan McGuire’s backlist but “Sleepover” is further proof that I will read anything Seanan McGuire writes- and like it. Tanya Huff’s Vicki Nelson series is another one I’m a fan of so I was pleased to see her story, “If Wishes Were”, included in SHADOWED SOULS. Mike has been injured and the trail leads Vicki in an interesting direction, one that will put Vicki’s skills to use if she is to resolve the problem. I love that this series has shown back up, even if only in a short story. Vicki is a great heroine and I suspect readers of “If Wishes Were” will want to read her Vickie Nelson series immediately to enjoy the character in a longer format. Anton Strout, Kat Richardson, Kevin J. Anderson, Lucy A. Snyder, Jim C. Hines, Erik Scott de Bie, Kristine Kathryn Rusch, and Rob Thurman round out the rest of this anthology. Each one is fascinating and I intent to read more by these authors soon. However, I have to mention the Kristine Kathryn Rusch story, “Sales. Force”, in particular. From the clever concept to the powerful emotional impact, “Sales. Force” hooked me! 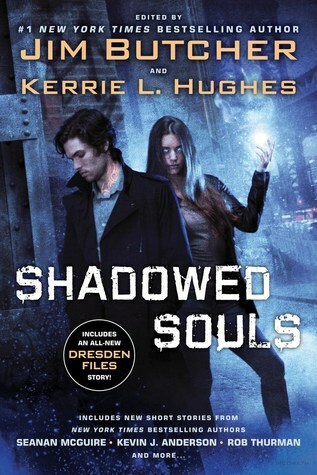 If you love urban fantasy and are a sucker for anthologies (like I am), then SHADOWED SOULS is a must-read for you. Urban fantasy continues to thrive as a genre and SHADOWED SOULS collects together eleven outstanding stories by a nice variety of authors. Highly recommended! Nell Ingram has finished her training at Spook School and is now ready to start working under Rick LaFleur as part of his Psychometry Law Enforcement Division (PsyLED) team. The team’s current case seems right up Nell’s alley as the land itself appears infected and the infection is spreading. Can Nell and the rest of PsyLED Unit Eighteen uncover the origin of the problem and stop the spread of the malignant infection before it grows even more powerful? I love Nell! She’s a great narrator for the story as she’s an intriguing blend of wisdom, wit, and innocence. Nell’s determination to become a full-fledged member of Unit Eighteen is apparent in every action she takes, as we see her learning even more about her own magical abilities. However, it is her quest for knowledge that makes her all the more fascinating. Faith Hunter incorporates some interesting scientific facts into the storyline of CURSE ON THE LAND– Spongebob, being one that sent me quickly to the internet and my friend Google. And oh, does Faith Hunter ever throw some twists at the PsyLED team in CURSE ON THE LAND! I don’t want to reveal too much but one of the twists definitely satisfied me and has me wondering how this will play into future events, particularly since we are seeing Jane Yellowrock’s name pop into the series more and more. I like that we get to see Nell beginning to emerge as a leader in her own rights and I can’t wait to see where Faith Hunter takes us with her character. 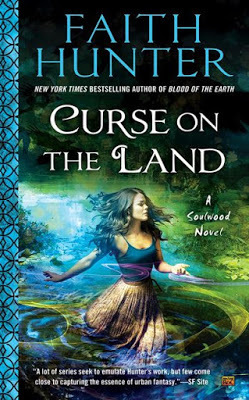 CURSE ON THE LAND is the second book in Faith Hunter’s Soulwood series and I highly suggest reading it in the context of the series as a whole. The majority of the story stands alone but Nell is continuing to learn about her own powers and there is an ongoing thread involving events from the first book, BLOOD OF THE EARTH. Besides, this series is simply too good not to be enjoyed! Highly recommended! Kate Daniels and Curran Lennart, the former Beast Lord, are making wedding preparations, starting with who will officiate their ceremony. Unfortunately, Saiman has been kidnapped and Kate can’t allow the challenge from her father to go unnoticed. Worse yet, a Witch Oracle sees a vision that the end of the world- or at least Atlanta- will occur if they follow through with the wedding. Can Kate change the future and keep the man she loves by her side? MAGIC BINDS is the ninth book in the Kate Daniels series and I highly suggest reading this series in order. The world building and character development have been building over the course of the series. MAGIC BINDS continues the story arc involving Roland’s encroachment on Atlanta and thus is best appreciated in the context of the series as a whole. Besides, the Kate Daniels series is one of the best urban fantasy series out there so missing out on reading even one book is just sad! Kate is one of my favorite urban fantasy heroines. I love her feisty attitude, even when odds seem firmly against her. MAGIC BINDS shows Kate with a new challenge- she has to fight her own urges to rule as her father does. Curran’s love for Kate and his willingness to help her through the moments when she’s not quite so human make me love him even more. And oh… how could I talk about MAGIC BINDS without at least mentioning Christopher and Roman. Roman may be my new favorite character in the series (second to Kate, of course). I love his snarky comments and hope we get to see at least a short story featuring him. As for Christopher, I won’t reveal spoilers but oh my! The revelations we get about Christopher alone would have made MAGIC BINDS a hit! 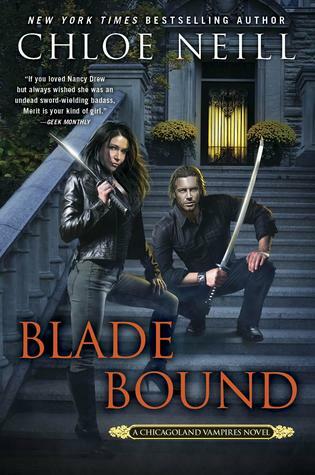 If you haven’t read a book by Ilona Andrews, stop what you are doing now and read the Kate Daniels series. You won’t regret it. 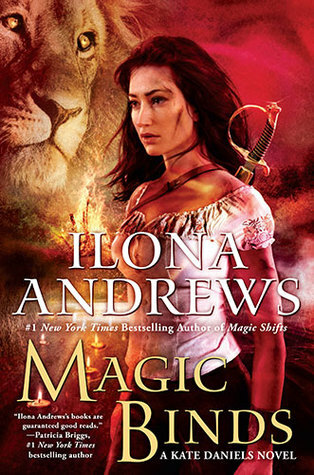 Ilona Andrews is one of THE best urban fantasy authors out there and the Kate Daniels series is proof. Highly recommended! Claire Connolly is learning more about her hidden magical abilities while moonlighting as an apprentice bounty hunter with Liam Quinn. Liam is aware that Claire is a Sensitive and he struggles to keep a boundary between them, ever fearful she could lose control and become a wraith. Should Claire become a wraith, Liam would have to lock her in Devil’s Isle, the government-sanctioned community for all individuals displaying paranormal abilities. However, a cult is now targeting anyone who isn’t actively interested in eradicating all paranormals. Can Claire and Liam work together to once again save New Orleans? Or will they have to sacrifice everything to stop Reveillon? 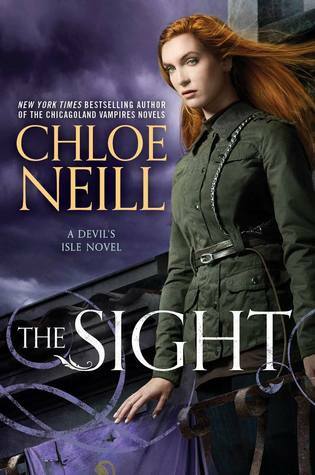 Chloe Neill does a marvelous job at furthering the world building and character development in THE SIGHT. THE SIGHT is focused more on the politics underlying the various factions as we start to get a better sense of just how divided the world has become. One of the aspects that really enhances our understanding of the world is that Claire is surrounded by friends who are in various roles within the new governmental system. Whether it’s seeing things from the perspective of a bounty hunter, containment agent, or a paranormal trapped in Devil’s Isle, we get an inside look at how the relationships intertwine. Claire is a phenomenal urban fantasy heroine! She isn’t afraid to do the right thing, even when it costs her everything. In fact, my only complaint with THE SIGHT is the enormous cliffhanger moment Chloe Neill leaves us with. My heart is still breaking for Claire and I can only hope Chloe Neill’s next book is published soon. Chloe Neill has rapidly become one of my favorite urban fantasy authors and THE SIGHT once again showcases her phenomenal talent. If you haven’t read THE VEIL yet, stop what you are doing and read that before starting THE SIGHT. Chloe Neill plunges readers headlong into the second book of the Devil’s Isle series, and oh what a treat she has for readers! Highly recommended! Nell Ingram is forging her own path as a “widder-woman”, free from the cult she grew up in. Unfortunately, some of the men from God’s Cloud of Glory Church just won’t leave Nell alone on her land, particularly after she helped Jane Yellowrock free a missing vampire and save more than a hundred children from the cult (see the Jane Yellowrock series for more details). Now, Rick LaFleur and his team from PsyLED want Nell to help them with yet another investigation as a paid member of the team. Nell will have to face her past if she hopes to move forward with her future. BLOOD OF THE EARTH is the first book in the Soulwood series, although it is loosely tied to the Jane Yellowrock series. Unlike some spinoff series, you don’t have to be familiar with any of the Jane Yellowrock series in order to appreciate BLOOD OF THE EARTH. Faith Hunter gives new readers (like me!) all of the necessary back story in order to thoroughly enjoy BLOOD OF THE EARTH. Faith Hunter does a marvelous job with character development! I love how Faith Hunter drops us little pieces of Nell’s story rather than giving us one giant info dump. Instead, we get to know Nell and her past gradually while watching her step out into her future. Nell is an intriguing character, and one I look forward to seeing more of in the future. However, I have to admit that I have a soft spot for Occam, the wereleopard, and how gentle he is with Nell, even as he allows her to stand on her own. Atmosphere is key to the success of BLOOD OF THE EARTH. Soulwood is a very unique land and I love how Faith Hunter makes it practically a sentient being. BLOOD OF THE EARTH shows us the mysterious connection Nell has with her land and it will be interesting to see how this develops as the series progresses. 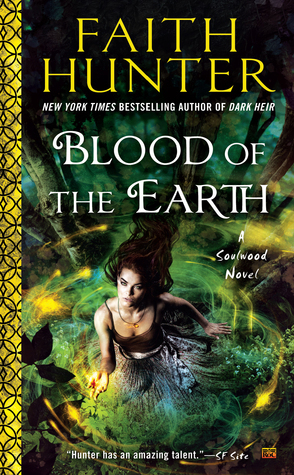 BLOOD OF THE EARTH is a stunning and exciting start to the Soulwood series. I have to admit that I’ve had friends telling me I need to read Faith Hunter for a while now and after finishing BLOOD OF THE EARTH, I’m convinced! Faith Hunter’s BLOOD OF THE EARTH is urban fantasy at its finest. Spectacular world building, superb character development, and a whole host of intriguing paranormal beings make BLOOD OF THE EARTH a must-read for urban fantasy fans. Highly recommended!